Starring Ajay Devgn, Riteish Deshmukh, Arshad Warsi, Javed Jaffrey, Madhuri Dixit, Esha Gupta and Anil Kapoor in lead roles and is the third film in the Dhamaal series of movies. Due to huge initial buzz, it opened to a great note and successfully maintaining the pace in weekdays as well after an outstanding opening weekend. 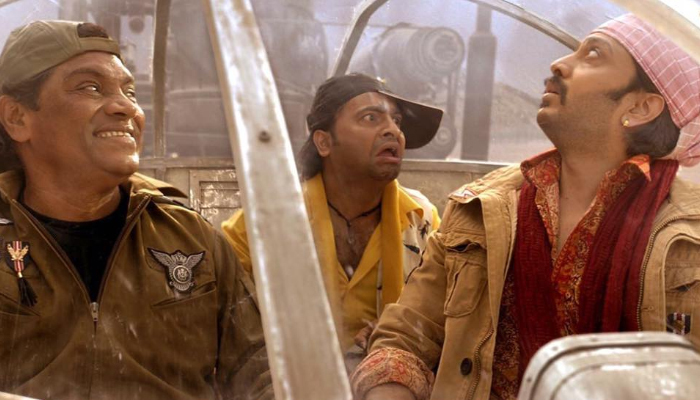 Directed by Indra Kumar, this adventure comedy has received almost positive reviews from critics and also audience found it very entertaining. As a result it gained good word of mouth and showing remarkable performance at box office. Despite having highly appreciated Gully Boy in opposite, it has diverted major audience toward itself. On the first day, Total Dhamaal started it’s journey on a strong note and registered second highest opening of the year in Bollywood with massive business of 16.50 crores. With which it has also become the third highest opener of superstar Ajay Devgn’s career so far. With similar pace over the weekend, Fox Star Studios’ production raked the business of 20.40 crores on Saturday and 25.50 crores on Sunday. After the weekend, total collection of the movie was recorded as 62.40 crores from around 3700 screens across the country. Now Total Dhamaal is running in weekdays and still has strong hold over the audience. On Monday Ajay Devgn starrer witnessed 44.8% of drop than Friday and bagged the amount of 9.85 crores. While on Tuesday, with slight drop it garnered the business of 8.75 crores and raised 5 days domestic total to 81 crores.